Sugar adds sweetness to tomato sauce and offsets any strong or tart flavors. Adding too much sugar to tomato sauce is not only unhealthy, but also can make the flavor unappetizing. If the sauce is too sugary for your tastes, add lemon to neutralize the sugar rather than throwing out the sauce. Add the lemon in small amounts to ensure a desirable flavor change. 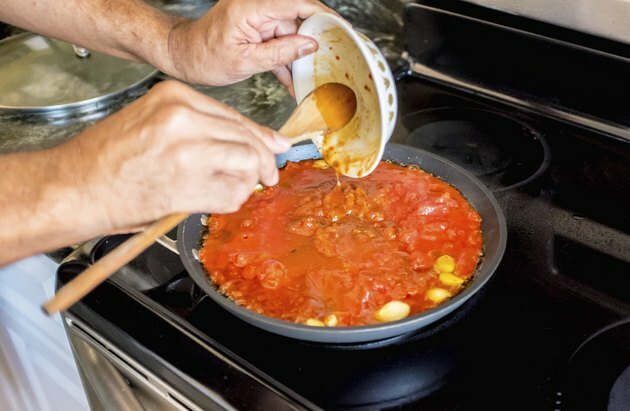 Heat the tomato sauce in a saucepan on a stove-top burner's low setting. Pour 1 tsp. of vinegar or lemon juice into the sauce and stir the mixture until the liquid until you completely combine the liquid. Taste the sauce to determine if the sauce is less sweet. Add additional vinegar or lemon juice 1 tsp. at a time until the sugar taste is neutralized to your liking. Taste the tomato sauce before you add the sugar to determine if the sauce is sweet enough. Add other spices, if you prefer, such as cumin, chili and fennel to lessen the sweet taste. Is There Any Way to Make Tomato Sauce Less Acidic?